This is the sentiment on my son’s t-shirt today, and I love it! Yesterday at International Quilt Festival, I was talking with a friend about the sad fact that 2 quilt shops where I used to teach have closed. 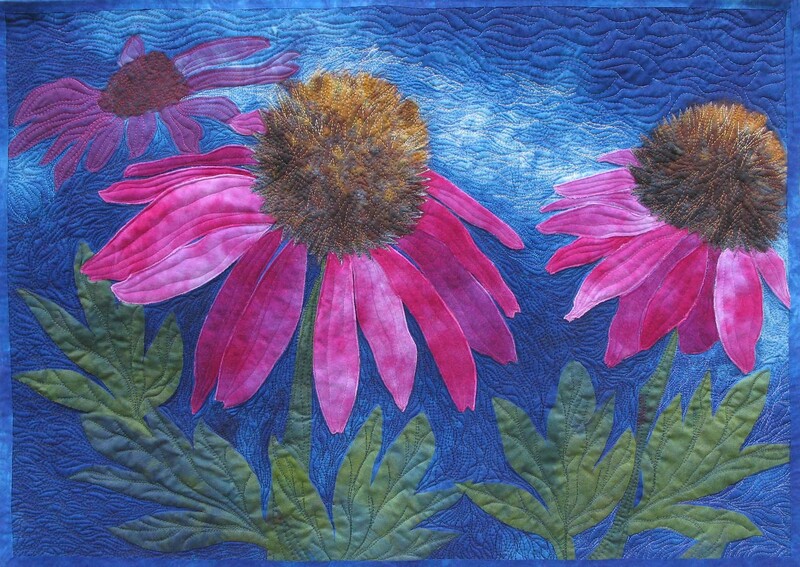 I love teaching art quilting, and said that I would like to do more of it. At that moment, someone who used to work at one of the now-closed shops walked by and asked me if I’m looking for teaching gigs. She is working at a different shop and suggested that I call her about doing classes there. We all make choices every day about how we are going to feel, how we are going to behave and what we are going to do. Most of these choices are so automatic, we don’t consider options even when there are many possible alternatives. So get off auto-pilot. Think about what you really do want. Then put your intentions out there. Do what you want – and get paid too!!! I also teach for guilds, so if your group or someone you know is looking for a workshop on art quilting, please contact me. You may have noticed that my posts are increasingly art-related, serene art of course, but no new serenity/stress management tools in a while. Well ok, before we have a mass revolt, think about this – I’ve already given you most of the important ones! Today, you get a new tool to add to your toolbox anyway. This is a really fun activity that is appropriate any time, and maybe particularly applicable for the new year (look outside – it’s still January!). 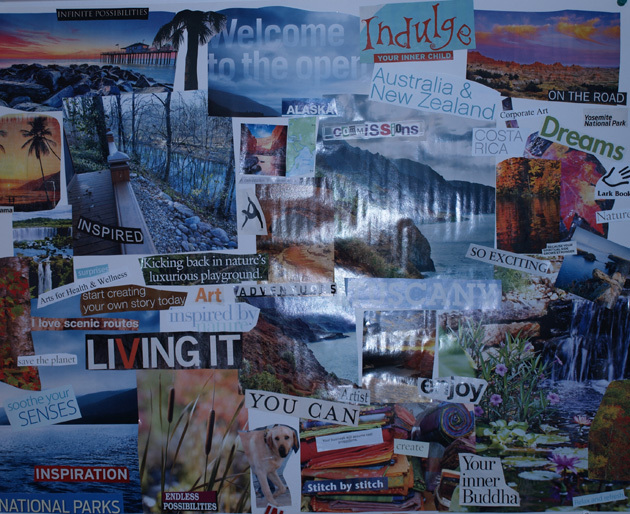 This new tool is called a VISION BOARD, and it’s ths simple. Gather a bunch of old magazines and cut out any images and words that appeal to you. Don’t overthnk it; just cut out anything that speaks to you – no reasons needed. Then take poster board or a large sheet of paper, and tape/paste your words and images onto your background paper. You’re going to feel like you’re back in kindergarten, and everythink was fun back then! So allow the child in you to come out for a few hours. Put your new Vision Board above your desk or anywhere you will see it daily. Bacause this is a “right brain” activity, your vision board will inevitably include some of the things that are important to you, things you want to accomplish, things that make you feel good. And here’s the best part – because your visions are in front of you daily, some of them are going to be realized. It’s not magic. It’s the gentle but constant reminder of what you want that will motivate you to take the steps you need to take to make these things happen. I have a piece of work published in Lark Books, 500 Art Quilts. I also have a piece in the Feb/March issue of Quilters Newsletter Magazine, and that wasn’t even on my Vision Board. My husband and I have gone on two wonderful trips. One to the Southwest where we spent time hiking in 2 national parks, Zion and Bryce. Zion is now one of my favorite places on eath. Our next trip was to Italy where we spent time in Tuscany, not enough time of course – must go back. What a beautiful country! I have spent alot of time at the Chicago Botanic Garden enjoying nature and scenery that changes regularly. Every time I go there, things look different. I’ve done alot of stitching. I did not get a dog but, amazingly, my next-door-neighbors did get that exact yellow lab on MY Vision Board. His name is Charlie, and I can play with him any time I need a dog fix. Christine Kane talks about having a word for the year to signal your intention, to make things happen the way you want them to unfold. I like this idea, and my word for 2009 was OPPORTUNITY. It was my intention to take advantage of each opportunity that appeared and to create new opportunities when what I wanted was not readily apparent. I did follow this intention throughout the year, and as a result, I entered some shows I might have avoided – and got in – such as SAQA Transformations 09: Reflections. I joined a wonderful group of artists, Fiber Artists Coalition, which means more exhibits, curating “opportunities”, and support. After giving it some thought this morning, I decided my word for 2010 is “PRESENT”. I want to be fully conscious, fully focused, in the moment, “present” for every piece of my life in 2010. I intend to be fully WITH whoever I am with, fully ENGAGED in whatever is going on EACH moment. How exciting! What’s your word for 2010? It’s a great time to start thinking about your 2010 goals. So here’s the follow-up to my previous posts about VALUES, VISIONS and GOALS. My 7/21/09 post was about the importance of goals being Fluid, Action-oriented and Relevant. My 8/7/09 post listed several questions to help you identify your core values, the first step in formulating Relevant Goals. Review those two posts now, then sit down to think about and write some goals. 1. Think about your VISION. How and where do you see yourself 6 months from now? 1 year, 5 years, 10 years? Visualize your future being exactly what you want it to be. Include as much detail as you want to. Example: My vision is to have my art being sold in 2 more galleries. 2. Now write the GOALS that will help you realize this vision. Your written goals can be short-term or long-term, and preferably some of each. GOALS are realistic; they should be reachable but not too easy – stretch a little outside your comfort level, but don’t set goals so high that you feel defeated before you start. GOALS are quantifiable; you want to be able to look at your goals at regular intervals and measure your progress toward achieving each one. GOALS are action-oriented; you want to look at each goal and visualize exactly what you are going to do to achieve it. GOALS are relevant; they reflect your core values. 3. For each Goal, write the specific STEPS TO ACHIEVE the goal. What exactly will you do to make that goal happen? These steps should be small increments and very specific. Example: a. Decide on a theme for a body of work. b. Decide size range for finished pieces. c. Create designs and screens. d. Dye and screen fabric. e. Work in studio at 4 hours/day. 4. Think about potential OBSTACLES to reaching each goal. Example: a. Not feeling creative. b. Time constraints due to other committments. 5. List the PEOPLE and other RESOURCES that can help you complete the steps to achieve each goal. Ask yourself, “If someone had a video of my typical day, what would they see? Based on your current actions and behaviors, where do I expect to be in 5 years? Now what changes do you want to make? VALUES and GOALS: Have you been thinking about your goals? Remember FAR – Fluid, Action-Oriented and Relevant? 1. What brings you joy? 2. What is your life’s vision? Dream – don’t worry about what is or is not “possible”. What do you see yourself doing 5 -10-20 years from now? 3. What personal qualities do you possess that you consider “gifts”? 4. What is the source of your power, your self-esteem? 5. What accomplishments, moments mean the most to you? 6. Finally, think about your 80th birthday celebration. (Use Visualization from my 3/30/09 post). Imagine this celebration as fully as you can. Who is there? Who are you talking to? People are toasting you – what do you want them to say about you/to you? What comments make you feel best, proudest? Did you have some New Year’s resolutions for 2009 way back in January? Are you working steadily toward those goals or are they long-forgotten? Whatever your answer, I think July is just as good a time to think about visions and goals. In fact, it’s a good habit to review and modify your goals on a regular basis. It’s also good to write down your goals and to talk about your goals. “Studies” have shown that committing something to paper and talking about it to other people makes you more likely to follow through on it. FLUID: Allow your goals to be flexible. As you change, they will also change. If you get too attached to a specific goal or outcome, you may miss many opportunities, either because you won’t recognize them as opportunities, or you will dismiss anything that does not fit neatly into your plan. ACTION-ORIENTED: Attach an action plan to each goal. Map out specific steps necessary to make the goal a reality. If you wouldn’t plan a road trip without a map, why would you plan your life without one? RELEVANT: First identify your core values. Then be sure your goals are relevant to those values. You will be much more motivated to work toward goals that reflect what is most important to you. In the next few posts, I’ll talk about identifying your values and related goals and mapping out strategies to reach your goals.